Kestner Chemical Pumps Limited have been producing reliable Chemical Process and Slurry pumps since the early 30’s at their site in Gillingham, Kent. Innovative design, quality and superb after sales service are characteristics which ensure that all of our customers can rely on the products we supply for long life and durability. 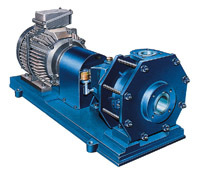 The KSI range of standardised centrifugal pumps are single stage end suction process pumps specifically designed to be manufactured in hard alloys for chemical process and slurry applications. Standard construction materials are 14-15% High Silicon iron or 27% High Chrome iron. The former material has an excellent corrosion resistance to a wide variety of process solutions, and in particular to all concentrations and temperatures of Sulphuric and Nitric acids. Combined with its characteristic of excellent hardness it also features excellent abrasion resistance. High Chrome iron is an economical material with high abrasive but non-corrosive slurries. Cast iron. Ni-Resist. Ni-Hard. Stainless Steel or any machinable alloy. Packed gland, Hydrodynamic expeller seal, Single or Double acting Mechanical seals. Cartridge type seals and conical design single internal seal housing – optional. Fully shrouded or Semi-open type impellers with back vanes for reduced axial thrust and integral shaft sleeves. Modular concept allows coverage of the Hydraulic range with two Bearing frame sizes. The provision of a cast iron clamp frame reduces pipe loading on the pump casing. A high performance hydrodynamic expeller seal effectively seals the shaft during operation, with a standard water or grease lubricated packing providing a stationary shaft seal. ‘Back pull-out’ design with standard bearing frames and ‘spacer’ type couplings. Minimum shaft deflection and end float (less than 0.05 and 0.03mm respectively) with oil lubricated bearings. End suction design with centreline discharge and extra thick volute casing sections for improved corrosion and wear resistance and smooth hydraulic flow. Minimum 3mm Corrosion allowance. Stainless steel flinger protects inboard bearing lipseal from chemical splashes. 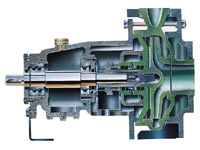 Kestner Chemical process/slurry pumps represent the latest in pump technology and will provide many years of trouble-free service, low maintenance and minimum down time. Contact Kestner to discuss your requirements and application.